One of my good friends has decided to go gluten-free. Between her lack of gluten and my inability to digest meat and anything spicy plus my hatred toward seafood, it’s amazing the two of us can find anything to eat together! What is gluten-free? Well glad you asked! Gluten is the protein that is found naturally in wheat, rye, barley, and any grain that comes from those evil culprits (Oats are still in question. I’m not really sure how that is possible but apparently it is.) To be considered “Gluten-Free” by the FDA, and therefore be able to carry those words on its labels, a product must have less than 20 ppm (parts per million). According to the FDA site “this is the lowest level that can be consistently detected in food using valid scientific analytic tools.” How they have tools to detect it and a definition to live by and still can’t figure out if oats are good or not is beyond me. Apparently that “level” of gluten can be tolerated by most people with celiac disease so is considered “a-ok.” Don’t tell my friend that. If she knew that things labeled “Gluten-Free” actually have small traces of gluten she will go on an all fruit diet or something like that. She is a stickler for food rules. What is celiac disease you ask? Let me tell you. Celiac disease is a digestive and autoimmune disorder. A person with celiac disease can’t tolerate gluten. Their body creates antibodies against the protein and in doing so attack the lining of the small intestine. That just screws up everything since the person can’t absorb what they need from their food with their pissed off intestine. As you can imagine that causes both serious and annoying problems. I think that sums up my views nicely. I was going to have dinner yesterday with my friend and in doing so needed to make something she would eat (without me having to lie about the ingredients). 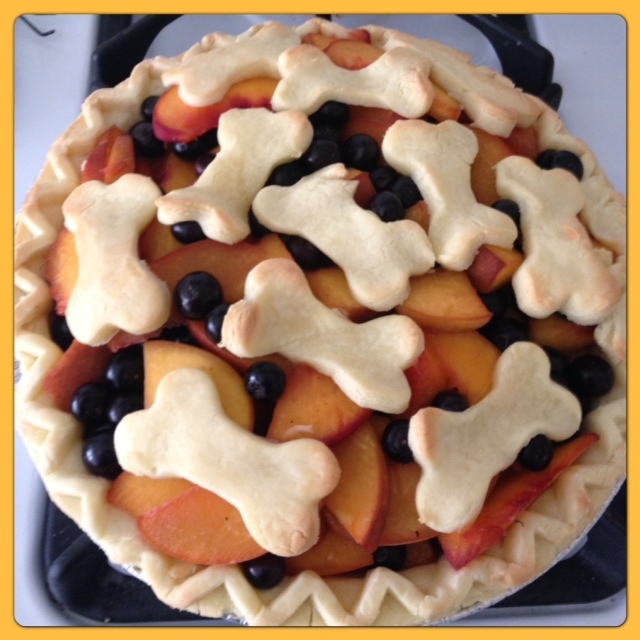 I had wanted to make a pie for a while so I decided to do that. Don’t ask me why I wanted to make a pie. Summer fruit just screams pie and I’ve never done it before so I wanted to give it a shot. Maybe it was a little elaborate for a last minute get together with a friend but I wanted pie damn it. Leave me alone. I didn’t make the crust. I’m not crazy. Look at those ingredients. What am I going to do with a bag of white rice flour? Plus xanthan gum, like grapes, is banned from my house because of its toxicity to dogs. Although I tend to feel if the recipe calls for 1/2 teaspoon or less you can just leave it out. I was smart and headed to Whole Foods and bought a package of gluten-free pre-made pie crusts! I read the recipe wrong and put in two teaspoons of orange juice and decided that was ridiculous so added another. Then I realized it was two tablespoons so I added a tablespoon for good measure. I know I used a 1/4 cup of sugar because I had just used that measuring device for Dragon’s food this past weekend and I knew exactly where it was. I washed it out first … honest. My plan was to use the second pie crust as a “top” but that didn’t work out well. Apparently it’s easiest to work with gluten-free pie crust when it is really cold which is different from the package that says “room temperature” so it wouldn’t do what I wanted. Instead I cut out little doggie bones (It was that or a Halloween theme. Those are the cookie cutters I own.) I REALLY wanted to put some flour down to help roll out the ball of dough (ball because I gave up screaming and mashed it all into a ball) with my bottle of wine (I don’t own a rolling-pin). I controlled myself. What’s the use of going through all this trouble to make something gluten-free just to throw wheat flour all over it at the end? I thought it was pretty yummy but remember I have very plain tastes. The gluten-free crust wasn’t horrific but I’m sure “regular” crust is tastier so do that if you can. It isn’t overly sweet, which I like. If you like sweeter I suggest slapping on some ice cream and going a la mode style! Use full dairy ice cream and sprinkle some wheat flour on top for an extra gluten kick! I want a slice ala mode.